We have heard many amazing and inspiring success stories from Kickstart participants about how changing the way they thought about food transformed their health and their lives. We decided these stories were just too good to keep to ourselves, so we’ve decided to start documenting them and sharing them on this page. We hope you will check back often for updates, and be inspired to eat better and live better! Today I am writing to you to express my sincere thanks for helping Dave and I significantly improve our health and well-being through your 21-day Kickstart program which we recently completed. We obtained so much knowledge and inspiration from each Tuesday night class, the food provided was delicious, and the transition from receiving meals to preparing them was seamless due in large part to the carefully crafted lessons offered by you and Pericles. Even though Dave and I had very different health issues, our new vegan lifestyle has changed our lives significantly! In my particular case, my horrible migraines, which I’ve suffered from since age 37, have completely subsided, my blood pressure has normalized, as well as my blood sugar, and my sense of calmness and well-being has never been better, and I am sleeping better than ever! And, so far, I’m down 19 lbs — amazing, considering I’ve not been able to lose a pound for over 2.5 years! While I can’t promise these results to everyone, I would, nonetheless, strongly encourage anyone who has the desire to feel a lot better, to give the program a try! If you are willing to stick with it, you may just feel better than ever too! On this day of Thanksgiving I would like to say thank you to Gwyn and the wonderful staff at GreenFare for their 21 day Kickstart Program. It was exactly what I needed to start me on my vegan journey, something I’ve been pondering about for a while, but not quite sure how to approach on my own. Their genuine support and guidance, very informative and eye opening classes, and yummy meals offered for the duration of the program was what helped me finally achieve my goal. Even though I was a vegetarian for several years before starting the program, eliminating dairy and the rest of animal products still made a big difference in my daily life and my health overall. Within a week my energy level started to go up and has stayed at a much higher level consistently, helping me be more productive, efficient, and joyful in my professional and personal life. I learned how to keep my sugar level stable and not binge on unhealthy snacks. I now sleep much better at nigh and have lost close to 15 pounds so far. It has been about three months and I am very happy to say that with the help of this program, a variety of recipes that we learned, and a very helpful class on label reading included in the program, I am able to stay consistent with my meals without much of an effort and during the times when it gets too busy, GreenFare’s meal plan helps me stay on track. Thank you, again, for offering this program in our community, you are a true blessing! I’ve lost 30 pounds since my GreenFare Kickstart class…and at 52, I’m now the same weight I was in my ’20s! Thank you, GreenFare! I wanted to convey to you last night that your Kickstart is a huge blessing to me. On 13 Dec 2018 I returned from serving as a overseas volunteer. During that time, almost 90 days, I had a lot of exposure to very-fine desert dust due to the archeology dig taking place on site. And, consequently, I had a lot of health issues that were concerning me. My first day back a dear friend asked me to lunch and I wanted to go to GreenFare. We had dinner there just before I left in September and I had enjoyed it immensely. The beautiful young lady, who waited on us at lunch, told us about Kickstart and I took the flyer. I pray a lot, actually over everything, and after I prayed I knew your program was my answer. It is excellent! It is both educational and inspirational! Your approach of supplying 21 days of meals is the BEST! It truly serves to establish the program firmly in place where it works – at home, and it reinforces sound eating habits sheerly through convenience. You have changed my life for good and I am very grateful. I will never forget the day (on day four), while standing over my Kickstart lunch spicing it up, when the most wonderful feeling of “well-being” came over me. Being an analytical person, I started analyzing “why do I feel this?” Then it hit me – it was my lifestyle change in my diet. The euphoric feeling of knowing I was on the right path to helping my body repair, and the delight of “hope” being alive in me that I would heal. Thank you! It is very special to be part of your dream and destiny to help people be healthy and change lives! May 2018 be a year of endless blessings for you far beyond your greatest expectations. Interesting, informative and insightful instruction by Pericles and Gwyn. Fun interaction with the class participants which contributes to the learning environment. Straight forward approach to meal preparation and eating which yielded impressive results — including loss of weight, substantial reduction of cholesterol and the satisfaction of not being hungry between meals reducing the desire to snack. The field trip to the market with insightful label reading highlighted the importance to be an informed consumer. 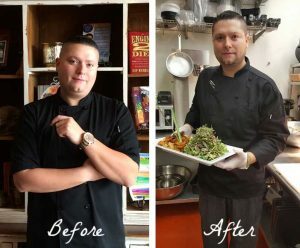 Since joining our staff in January and completing our 21-Day KickStart Program, GreenFare’s Executive Chef, Justin Matthews has lost 18 pounds! He looks and feels fantastic and we couldn’t be more proud! Inspired by Chef Justin’s success? Take the next step toward living healthier and join our next Kickstart Program! I thought I’d let you know that I received my blood test results this week after one month plus on your program. My total cholesterol has dropped from 184 to 104, my good to bad ratio improved dramatically, I’ve lost over 20 pounds of ugly weight and I’ve not felt this well or fit for years. My only problem so far is that I can’t stop preaching this program to family, friends, neighbors, or anyone in my life for whom I care. For the first time I’ve fallen into a lifestyle that is not only health but fun to be a part of. The meal plan Pam has devised follows exactly those recipes provided in the program and in other publications/books to which we’ve subscribed. I look forward to each and every meal and have yet to be disappointed. I really don’t feel that I’m missing anything in my diet, in fact my cardiologist has dramatically reduced the quantity and dosage of my medications as a result of the program results. I’ll also suggest to Pam to send you her amazing results which, among other things, includes NO migraine headaches for over 2 months, the same awful headaches she was previously burdened with 2-3 times a week. So, just wanted to pass on our sincerest appreciation to what you and your team are doing to significantly change for the better the lives of those fortunate enough to get involve in your program. Hope to see you soon and all the best. In January 2016 I took part in the 21-day Kickstart at Greenfare. It was hard! Until then I had tried several different ways of staying away from my yearly one-week-long hospital visits, but none had worked. Eating salad is my usual trigger for a Crohn’s attack. I cannot digest fiber well. A bowl of arugula is all it takes for me to need corticoids for two months. My personal struggle to eat healthy while staying away from the hospital was, until then, a losing proposition. Since 2006 until 2015 I tried but was not successful. During the KickStart I remember having cramps and thinking that, while the plant-based dishes were mostly cooked and did not immediately trigger my flare-ups, I still thought that eventually they would. I was so wrong. I have been flare-up-free since that time, and have been able to control my weight, eat healthy plant-based meals most of the time, and get rid of my sugar craves. I did not believe that I could actually survive only on plants. As a Brazilian, used to eating meat twice per day, I thought that would be impossible. And at times, during 2016, it certainly seemed like that. Two years later, I can say that having GreenFare here, receiving emails that remind me there are other people on this same boat, reading books on the background of plan-based nutrition, and watching documentaries on this subject, have all helped me enormously. I will be forever thankful to GreenFare. I now know to recognize the control we have over what we eat, and the consequences it makes in my life, even if just a tiny bit a day. Over the last two years I have seen my digestion change for the better and, even when I feel a slight unease in my stomach, I know that is just because I had too much arugula, which I can now digest! “My life has changed dramatically for the better, and I am only on Day 9 of the 21 Day Kickstart Program. Eating the delicious whole plant food dishes prepared by your GreenFare Restaurant make it easy to stay on track, thereby, avoiding all the trigger foods. The chronic joint pain in my hands and feet has greatly diminished. I have lost weight, have more energy, and am sleeping better at night . My mind is sharper than it has been in many years. Kickstart is an answer to my prayers! When I was in my mid-40s, I accomplished weight loss and road race performance milestones that earned me significant recognition on the Runner’s World web site, which is read by millions of people worldwide. As I got into my late 40s, my race plans were cancelled again and again as long training runs would result in significant stiffness and sometimes injuries. Doctors and physical therapists could not offer any useful advice. 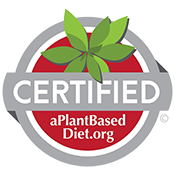 Now, after educating myself through GreenFare’s 21-day kickstart program and embracing a more compassionate, plant-based, healthy eating lifestyle, my life has changed. Recently I ran 15 miles on a Saturday, then on Sunday I won my 40-49 age group in a 5K race, also beating all the runners who were in the 20-29 age group. A week later, a 20-mile training run at an 8:21 per mile pace yielded absolutely no discomfort afterward. I have never experienced that before. I cannot thank GreenFare enough for enabling me to enjoy my life more fully now by pushing past barriers that I could not previously conquer, and giving me hope for an active future as I run toward my 50s!